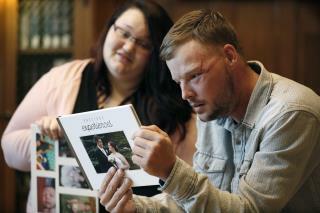 (Newser) – Sixteen months after transplant surgery gave Andy Sandness the face that had belonged to Calen "Rudy" Ross, he met the woman who had agreed to donate her high school sweetheart's visage to a man who lived nearly a decade without one. The two came together last month in a meeting arranged by the Mayo Clinic, the same place where Sandness underwent a 56-hour surgery that was the clinic's first such transplant, the AP reports. With her toddler Leonard in tow, Ross strode toward Sandness, tears welling in her eyes as they tightly embraced. Ross had fretted before the meeting, fearful of the certain reminders of her husband, who took his own life. But her stress quickly melted away—without Calen's eyes, forehead, or strong cheeks, Sandness didn't look like him, she told herself. Sandness put a rifle below his chin in late 2006 in his native Wyoming and pulled the trigger, destroying most of his face. Ross shot himself and died in southwestern Minnesota a decade later. By then, Sandness had receded from contact with the outside world, ashamed of his injuries. Hope first came in 2012 when the Mayo Clinic started exploring a face transplant program and again in early 2016 when he was wait-listed for the procedure. Ross and Sandness' ages, blood type, skin color, and facial structure were such a near-perfect match that Sandness' surgeon, Dr. Samir Mardini, said the two men could have been cousins. "I wanted to show you that your gift will not be wasted," Sandness told Ross. DID HE GET THE DEAD MAN'S D!CK AS WELL? Let me understand this: the wife of one suicide bequeathed his face to a would-be suicide. Why would a wife do that? All I can think of is that it is some kind of denial.